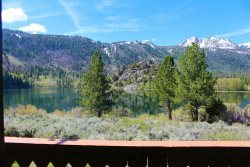 Visit June Lake and surround yourself with the beautiful High Sierra Nevada Mountains, crystal clear alpine lakes and a wonderful vacation experience. Our town is a small town, located between Yosemite National Park and Mammoth Lakes that has four seasons of fun and relaxation. Come and discover the Fall colors, perfect winter powder, and trophy Brown Trout. Come and stay in one of our exceptional A-Frame style June Lake cabin rentals at the base of Carson Peak with views of the Ansel Adams Wilderness. From this ski-in ski-out cabin rental, ski directly from your deck into an exceptional cross-country skiing experience. If you want ski lifts, there are none here. Just pure mountain white powder and fantastic cross-country. This is the purest form of ski-in ski-out. This specific location is named after the historic ski slope with a rope tow that no longer exists. Four Seasons is located between Silver Lake and Gull Lake along June Lake Loop. If you are looking for a normal ski hill with lifts, head to June Lake Mountain 1 mile down the road. Enjoyed our stay. Accommodations were very adequate. Very beautiful house, amazing view, great location! It's pretty sweet the way it is: low key and not fru fru. Could probably use another BBQ in the busy season. Great family vacation. June Lake is a favorite vacation destination. We always stay at the Four Seasons and can't wait to go back! Your Management team got everything right for our trip. Excellent communications before our trip so we knew what to expect. Your staff prepared a very clean and fully stocked cabin for our stay with plenty of towels and supplies. The cleanness of the cabin was a home run for my wife. Due to that simple difference, we would like to come back. The real excellence here was the customer service by one of the owners, Jamie. After we booked, she was in constant contact with us, making suggestions on what to bring and giving us weather updates. Since we were first timers, she also sent us suggestions on things to do. This alone made me feel comfortable that we were staying some place that actually cares about their customers. I would recommend this place to anyone and we will stay there again on our next trip to June Lake. We recently stayed 6 nights at the Four Seasons. These are 5 older A-frame chalets off the June Lake Loop road. Each cabin is about 900 square feet, which was quite enough room for my family of four. The upstairs loft had 3 single beds, and a dresser. There was still enough room for a floor sleeper or two, or the supplied roll-away bed. The main bedroom had a queen bed, and a dresser/vanity combo. The living room had a futon couch, which was also a queen sized bed. This place could easily sleep a family of 10. There is also a kitchenette, lacking only an oven, an apartment sized fridge, a fireplace and 2 tables, one in the kitchen and one in the main area, which we used for a game table. there is also a small patio in back, which had a lounger and three chairs. The patios afford you a front row view of Carson Peak, and the wildlife show every morning and evening of deer and the occasional bear. (Don't leave food or trash out!) There is a gas bbq in the common area in case you want to grill, which we did. Our cabin was clean and well stocked. We had all the basic utensils we needed to cook and clean. I would suggest bringing your own knives if you are making special dishes like we did. I would also suggest bringing a box fan or two if you are there in the summer. There is a hiking path directly behind the Four Seasons as well. There is a tv which we turned on a few times for news and weather. Unsure about internet since we unplugged as much as we could. Overall, we enjoyed our stay here and encountered no problems. It is not in the village and there is no lake view. However, we were not there to look out the window, so it was an excellent base to explore the area.